I started reading this book the third week of September 2014 – the same week I attended a “Preach the Word” conference in Baltimore, Maryland. That conference, along with this book, has really challenged me concerning the preaching of the Word of God! Outstanding, solid read! If I was teaching a college-level class on the subject of preaching, this would definitely make the list of textbooks for the students to read, study, and dissect. It does not take long for one to realize that the author has done his homework concerning this book. Of course, his preaching ministry over the past thirty years only adds to his vast knowledge and wisdom concerning this topic. I love the humility of this author as he teaches all of the facets of preaching. Here are several items I really enjoyed about the book. First of all, the author makes points throughout the book in an alliterative fashion. Being a lover of words, I found it fascinating and could only imagine that he preaches in the same style. Second, the wide variety from which the author gathered quotes, illustrations, and anecdotes continued to capture my attention throughout the book. Third, an entire chapter was given concerning the public invitation at the end of the service. 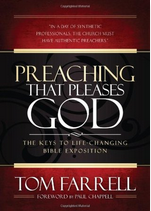 The author submits that the invitation is as much of a part of the preaching as the message is. However, what I found fascinating was that he set forth two differing viewpoints on the public invitation from well-known godly men of the past. He concludes with reasons he believes are Biblical for having a public invitation and pressing for decisions. It is just good to see a Bible-believer actually set forth opposing viewpoints and allow the reader to actually think for themselves. Fourth, at the end of every chapter is an actual outline of the chapter just read. What a help to the student and another aid to help remember the truths set forth in that chapter! Any preacher or teacher of the Word of God would learn much and do well to have this book in their library! Thanks for the review, Bro. Josh. I am going to put this on my purchase list. You will not be disappointed Bro. Brian…it will only better you in preparing God’s message for God’s people each week!